Idaho covers 83,574 square miles and has a population of 1,293,953 people. 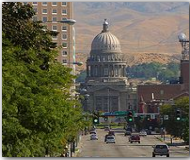 Idaho’s capital is Boise, which has a population of 185,787. Other important cities are Coeur d’Alene (pop. 34,514), Caldwell (pop. 25,967), Idaho Falls (pop. 50,730), Lewiston (pop. 30,904), Meridian (pop. 34,919), Nampa (pop. 51,867),Pocatello (pop. 51,466), Twin Falls (pop. 34,469) and Moscow (pop. 21,291). Idaho was admitted to the Union on July 3rd, 1890 as the 43rd state. It’s bordered by Washington and Oregon on the west, Montana and Wyoming to the east,Nevada and Utah to the south and Canada to the north. The state flower is the “Syringa” and it’s nickname is “Gem State”. Idaho’s economy is broken into two categories; agriculture and industry. Cattle, potatoes, dairy products, wheat, sugar beets and barley provide for the agricultural side. While food processing, lumber and wood products, machinery, chemical products, paper products, silver and other mining and tourism provide for the industrial side.